The demonstration was conducted by Ball and instructors Michelle Moore of Boynton Beach and Marty Charney of Tamarac. A brief history was followed up with a discussion on rules and basics of the game. "I live for pickleball," a laughing Charney said. "I've played tennis for 40 years, and this is so social and such a nice game. With a small court you have lots of teamwork and strategy." Women play equally with the men. 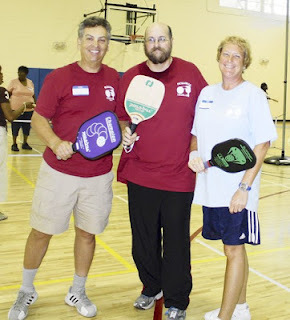 Canadians Dennis Hradil and his wife Anna call Tamarac their winter home and are big fans of pickleball. "We play in Canada all the time and at 65 I'm one of the younger players," Dennis Hradil said. "You can play this game into your eighties and I'm happy they're starting this here."